One of our patron saints in Beloved Life is undoubtedly St John of the Cross. The spirituality and hospitality of the Carmelites have been foundational for us, and the writings of this extraordinary 16th century Spanish Carmelite friar continue to provoke and inspire us in our attempts to explore the ancient and unfolding Jesus tradition. St John’s spirituality is a passionate spirituality, full of love and desire for God. It is also earthy and demanding, familiar with suffering, darkness and descent. 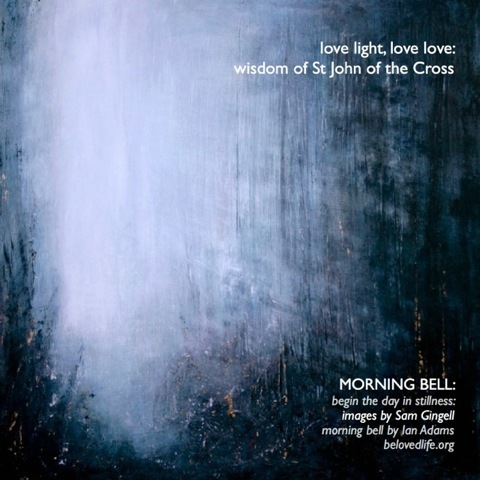 As we continue through the waiting time of Advent towards the Nativity of the Christ this series of the daily morning bell – ‘love light, love love’ – will be shaped around phrases of St John from his ‘Sayings of Light and Love’.